OmniFocus 2 for Mac offers convenient ways for capturing information into OmniFocus, whether it's a thought that has popped into your head or something on your computer or the Internet that you want to take action on. The process for capturing on your Mac is essentially the same in OmniFocus 3 as it was in OmniFocus 2. 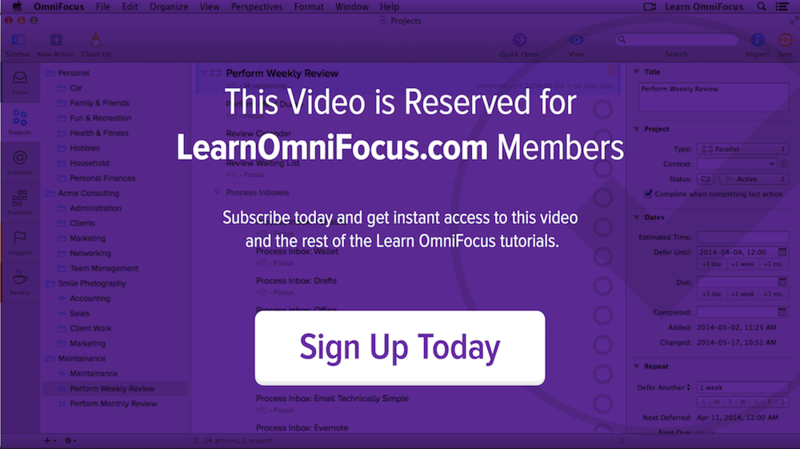 Note that it's no longer necessary to use the OmniFocus Clip-o-Tron app/plugin to integrate OmniFocus and Mail. And make sure you choose the "OmniFocus 3: Send to Inbox" service when you're creating a global keyboard shortcut. How to capture tasks using Quick Capture. How to assign a system-wide shortcut key to Quick Capture. How to use the "OmniFocus 2 Send to Inbox" Mac OS Service to capture information from Safari, Finder and Mac OS Mail.